Plus Size Kitten: Althea Korea - Best Korean E-Shopping Site in Malaysia! 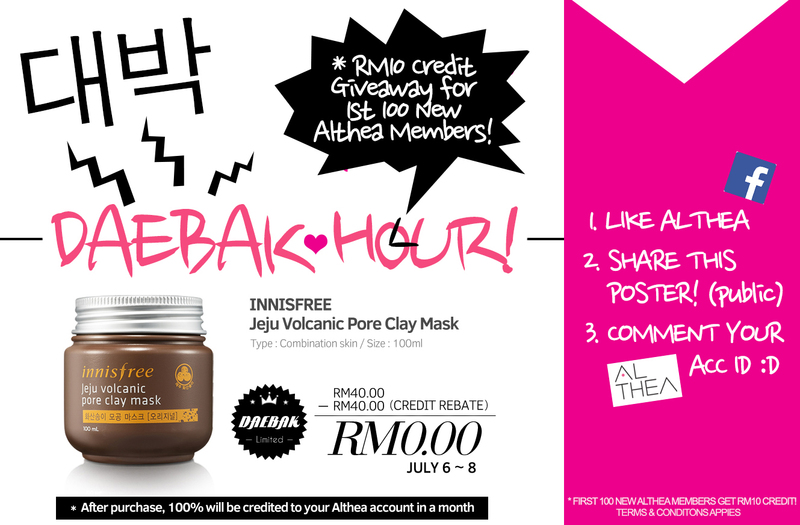 Althea Korea - Best Korean E-Shopping Site in Malaysia! last day to grab this awesome freebie! Readers, I want to share an awesome deal today to everyone. If you haven't heard about it yet, there's a new Korean online marketplace in Malaysia now called Althea Korea (Althea is the national flower of Korea). It features the best of K-Beauty products (Korean Beauty) from popular brands in Korea like Laneige, Innisfree, Tony Moly, Too Cool For School, The Saem, Sulwhasoo, SkinFood, The Face Shop, Holika Holika, 3CE, Missha, IOPE, Guerisson, Primera, Nature Republic, Primera, Belif, Etude House, LabStory, It's Skin, Clio, Banila, Peripera, Petitfee, Elizavecca and many more Korean brands. Everyday there's new items added and if you don't find what you're looking for just Facebook them!. LAST DAY TO GRAB THIS!!! Launched on 1st July, 2015, Althea Korea shocked us all with their amazing grand opening promotions, including a 3-day Daebak deal. Daebak means Jackpot in Korean. The first Daebak deal was RM1 Nature Republic Soothing Aloe Vera Gel. Then 2 days ago, they launched RM0.00 Innisfree Jeju Volcanic Pore Clay Mask. The interesting thing is, it's 100% credit rebated when you purchase. Meaning you have to purchase it at RM40.00 and within a month, you'll receive the amount back in credit form in your account on Althea. That's a smart marketing gimmick I must say. Keeps us coming back for more! Not that I am complaining because Althea has the best selection of popular products to get at a competitive price! Seriously, things are so cheap there you don't need to fly to Korea to shop anymore. P.S: They say with Air Asia, now everyone can fly. I say with Althea, now everyone can shop. 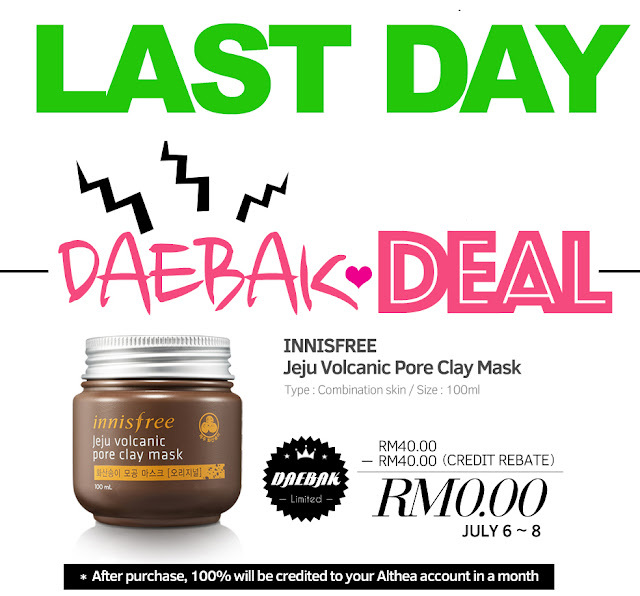 I would urged you to quickly register and get that RM10 credit for new account registrations and start grabbing the Innisfree Jeju Volcanic Pore Clay Mask at RM0.00 today and also qualify for RM20 off RM150 purchase. We know shipping costs is a pain for anything international so I am really happy to say that once you shop over RM100, it's Free International Shipping directly from Korea to your doorsteps in Malaysia! (usually it's RM150, which is peanuts to us to achieve). Under RM100, your shipping charges is depending on weight e.g under 500g for RM26 and over 500gram its RM34. every purchase comes in this beauty box! This is seriously a happy news to all shopaholics and beauty addicts in Malaysia now to be able to get their hands on affordable Korean popular products without breaking their bank account. I will share next about my first haul as their beta tester :) blogger (yeap! 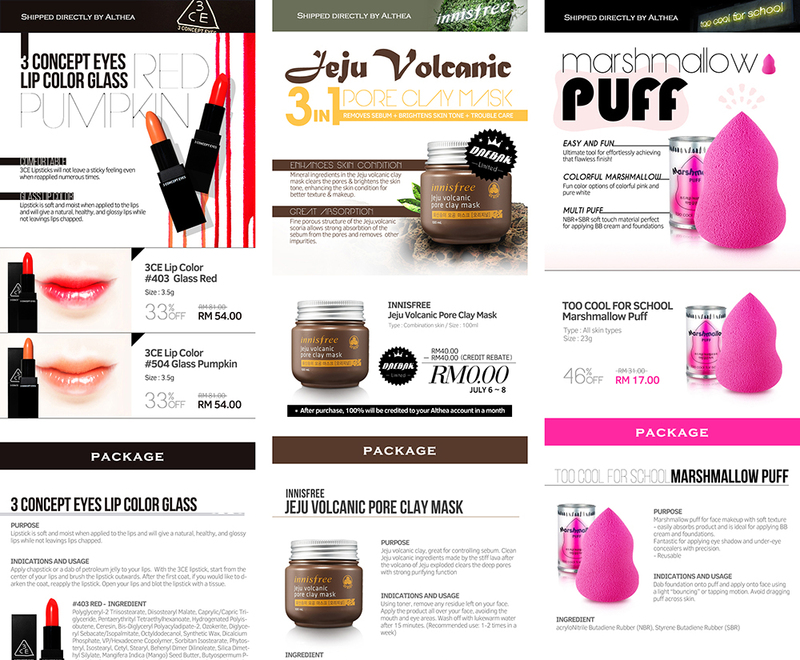 I got to join their beta testing period where I discover Althea's website and did some shopping on products I'd like to try). What did I buy? *Before prices is not based on Malaysian retail prices! how amazing is that! Looks like they've got some really serious deals on the site! Visit our website and play exciting flash games. Thanks you for sharing!